Ultralight flight case with custom suspension interior. 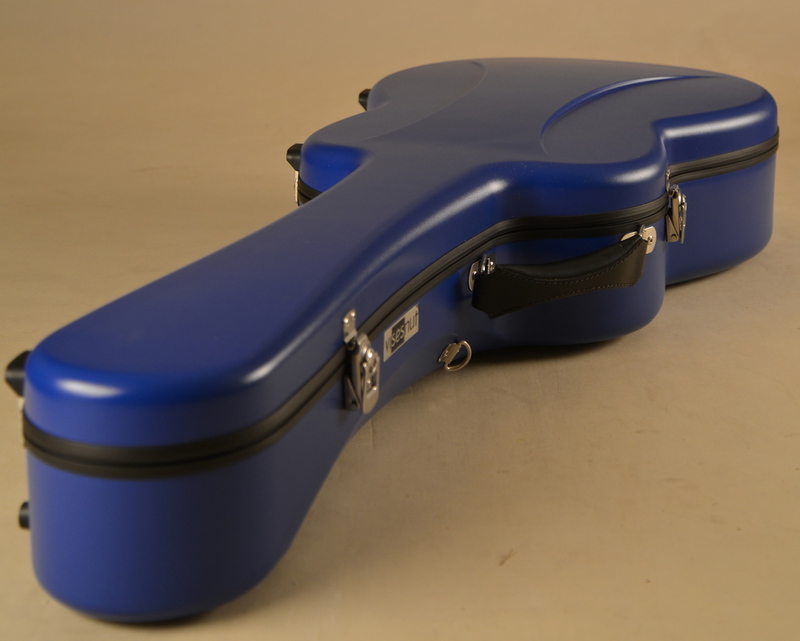 Visesnut guitar case (Thailand) This revolutionary new design was developed by “Jeep” Visesnut of Thailand, who is also a talented guitarmaker. The case weighs a mere 7 pounds empty, far less than most other cases, and is exceptionally strong, easily supporting the weight of a 200 pound person standing flat on the lid. The case body is made from a unique double wall structure designed to absorb impacts and insulate from extreme temperature changes. The handle is large, comfortable and made of leather for flexibility and durability. The locking latches are stainless steel and the back pack straps (included) have very secure locking nut “D” rings, tested to withstand a 100 pound drop test. There are no protruding latch parts to impale the guitar if the lid were to accidentally close while removing or replacing the instrument. The lid stop strap is designed to ensure the lid remains open when replacing or removing the guitar, and there is a redundant lid support stop on each nickel plated brass hinge. The exterior bumpers are cushioned durable plastic widely placed on the case to ensure stability when the case is standing in either a vertical or horizontal position. The lid and body meet with a special cushioned gasket seal to ensure humidity control, water repelling and intimate contact of the lid and body for superior strength and case integrity in the event of severe blows to the exterior. 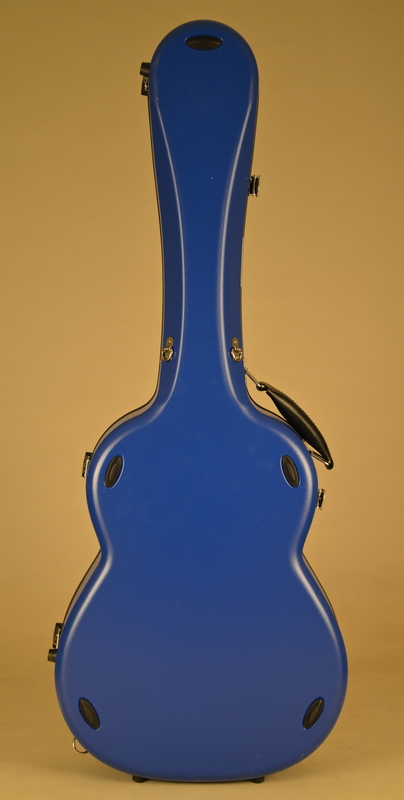 Inside, the case is plush lined with a unique adjustable cushioned suspension design which allows the case to custom adjusted to fit just about any standard and many smaller sized classical guitar models. Whether you have a very large bodied Ramirez 1a or a petite smaller bodied Torres, the interior can be adjusted in seconds to hug the body with the unique velcro adjustment straps located in the string compartment, Once adjusted, they retain the memory of the guitar they were fitted to, so no need to re-adjust unless you change to a different guitar size. This incredible adjustment feature is unique among all cases on the market today and is a revolutionary advancement in protection. 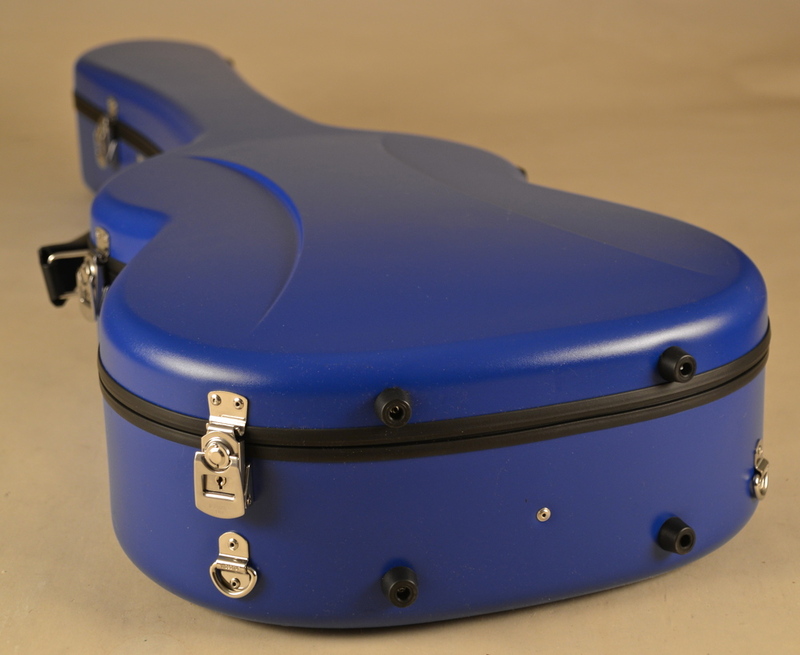 The neck supports are completely cushioned and gently support the neck in all dimensions when the case is closed, eliminating the potential shock to the instrument head in extreme drops. The interior accessory compartment has a soft hinged lid which is easily removable with velcro attachment. NOTE: The blue case shown here on our website is the very same case used during the entire week of NAMM (when these were introduced by “Jeep” Visesnut assisted by Marshall Bruné where it was the torture test demonstration case), and it was also used in our graphic video demonstration of the strength of these cases posted here. It was photographed AFTER we filmed the demonstration which showed us standing flat on the lid and then throwing it on the floor while my rare 1923 Domingo Esteso ex Ramon Montoya was inside. After these tests, the guitar was not only not damaged, but still in tune! DO NOT TRY THIS WITH YOUR CASE! Available exterior colors: Black, Winter White, Royal Blue or Lemon Yellow: $850, Premium colors of Copper Bronze or Black Pearl are $900. We strongly urge the addition of the optional soft cover.